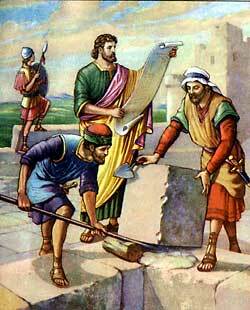 Nehemiah supervises the rebuilding of the walls of Jerusalem. EWS OF NEHEMIAH'S talk with the rulers and the priests spread rapidly among the Jews living in Jerusalem. And they rejoiced because God had sent this nobleman from the palace in Shushan to help them rebuild their city. The great work began at once, and nearly everybody seemed interested. Of course there were some who stood back to find fault; but they could not crush the zeal of the busy workers. Even the women wished to help in the building, and some of the rich women hired workers to build a part of the wall. The high priest said he would rebuild the Sheep Gate. There were several other gates to rebuild, and soon there were several other persons promising to rebuild them. So the Sheep Gate, and the Horse Gate, and the Fish Gate, and the Valley Gate, and the Water Gate, and every other gate of the broken-down wall was soon rising up in the same place where Nebuchadnezzar had burned the former gates many years before. And some promised to repair the wall in front of their homes, while others promised to repair longer stretches. But before this work could be done, the people set to work clearing away the rubbish and gathering out the great stones. What a busy crowd of workers they were! Nehemiah rode around the walls on his horse and directed in the building. When Sanballat and Tobiah, two enemies who lived near Jerusalem, heard that was taking place, they were very angry. They did not wish to see this great city rebuilt, for they feared that the Jews would no longer allow them to come into Jerusalem and oppress the people who lived there. So they planned many ways to hinder the building of the wall. First they made fun of the Jews, and pretended that the wall was not strong enough to offer protection in times of danger. They said, "If a fox should try to walk on the wall it would tumble down in ruins again." But Nehemiah and his workers paid no attention to the jokes and jeers of their enemies. They kept right on with their great work, and would not stop to answer back. Finally Sanballat and Tobiah saw they must do something else to hinder the work, so they wrote letters to Nehemiah, saying, "You have come to rebuild Jerusalem and set yourself up as a king over the city. Then you plan to rebel against the king of Persia." But Nehemiah answered, "I have not come for such a purpose," and he kept on with the building. Now the enemies were angry, and they planned to come and fight against the men of Jerusalem, and kill them. But Nehemiah heard about their plan, and he armed the men with swords and spears on every part of the wall. Some worked with one hand while they held a spear in the other hand. And all the while, both day and night, guards stood about to watch for the approach of the enemy. At last the walls were built, but the doors of the gates were not yet set up. The enemies had been afraid to come and fight, for they had heard that Nehemiah and his workers were armed with swords and spears, so they planned to act friendly and call Nehemiah away from Jerusalem, on a business trip, to one of their cities. Then perhaps they intended to kill him there. But Nehemiah would not go, for he said, "I am doing a great work, and I can not leave it to come down to your city." After fifty-two days, or nearly two months, the entire wall was finished. And the people of Jerusalem were very thankful that Nehemiah had come to encourage them and to build up the broken wall of their ruined city. They saw he was interested in them, and soon they came to tell him about other things that troubled them. They explained why they were so poor and so discouraged. Nehemiah listened to their words, and then he called the rulers and told them what the poor people had said. The rulers were ashamed because they had never tried to help these people. Now they promised Nehemiah that they would do better. For twelve years Nehemiah stayed in Jerusalem and acted as governor of the city. Then he knew that Artaxerxes, the King, would be expecting him back in Shushan; for he had promised to return at that time. So he appointed his brother Hanani and another man to rule the city while he should be absent, and then he hurried back to see the King. Artaxerxes permitted him to return the second time to Jerusalem, and Nehemiah's work on this second visit was more the work of restoring the customs that God had commanded by Moses for the people to obey. Because of the faithful efforts of men like Nehemiah and Ezra, the priest, the Jews began to pay more heed to the teachings of God's law. They began to act more like a separate people, uninfluenced by their heathen neighbors, and they refused to worship idols any longer. By and by other teachers rose among them, and these teachers wrote law-books, which they called "traditions." These teaching were very strict; but God was not pleased with them, for he had not commanded that they should be written and obeyed. Malachi, the last of the prophets, came to speak God's words to the people while Nehemiah yet lived. This faithful prophet told the Jews about the coming of Jesus, the Savior, into the world, and he wrote his words in a book. The Jews kept his book with the other books that Ezra, the priest, had given to them. And Malachi's writings are the last words we find in the Old testament.